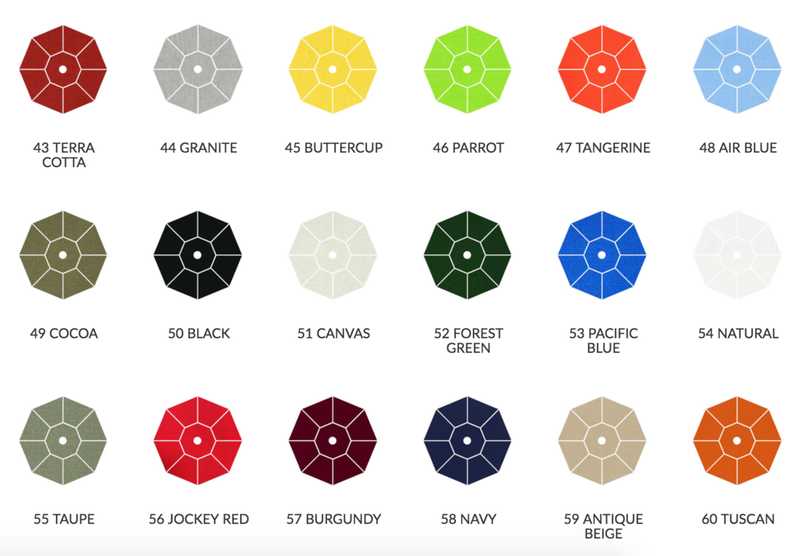 Fleet-Plummer has the Triad's best selection of colorful and durable outdoor umbrellas. Come speak with one of our free design consultants today! Come take a look at the best umbrellas in the world! We have many different fabric options to choose from as well as different finishes. Let us help you find the best one for your existing space or let us help you put together a whole set with matching furniture. If you don’t see what you like, we can certainly order an umbrella with the fabric that you prefer. Come talk to one of our specialists and we’ll help you find the perfect umbrella. These aluminum umbrellas utilize stainless steel cables and patented auto tilt mechanisms, designed with the finest materials available. Sunbrella is 100% solution-died acrylic fabric. Sunbrella is recognized as the industry leader in outdoor fabric. The solution-dying method locks the color into the fiber insuring that the fabric with not fade with exposure to UV rays. Sunbrella is warranted for a period of 5 years from the date of purchase.